I wear this protective clothing when I'm badly working on oil stains. Because it is disposable, the underlying work clothes are saved without getting dirty! Because it is cheap, I use it every time when I work on oil. This review is about item#02463176. This review is about item#09150811. Ideal for work such as under the floor. It is stronger than the one you purchased before (at another shop). Although it is a product close to paper, it is appreciative that it is hard to break. I will not use it so much that it will be damaged soon, but I'm looking forward to how much I have it. Although I had purchased the same item many times, the thing that I bought the other day seems to have become a little smaller size because there is no rubber in the hem. I have been told by those who are using the date a long time since it arrived. When I was reading the details of the product frequently, it says "There are things that have no rubber in the hem due to some specification changes." If possible, if the specifications have changed, I would like you to make it different code. I think that purchase is considered if it is changed even if even a little because the characteristics of the product are bought in mind. In addition, "There is something that rubber is not in the hem due to some specification changes" is meaningless to understand from the purchase side. How can I distinguish between one with rubber and one without rubber? Since the product is finished as soon as it gets lost, when different specifications change from now on please specify a different code. This review is about item#09150845. Because it is antifouling purpose it can be used without problems. This review is about item#09150836. I am intelligent in work such as cleaning. It is easy to choose and easy to use because there are various sizes. This review is about item#02463194. I tried using SMS protective clothing for the first time, but strength and waterproofness had no problem at all. However, the hood was small, and when putting goggles, my head could not be covered completely. It is perfect if there is room in the size of the hood. I will try to compare 3M protective clothes next time. Dust prevention Anti-staining powder spraying etc. It is handy and easy to use. This review is about item#02463185. Because it is disposable, I was satisfied with the price, I purchased L · LL, but since L seemed to be torn, I got everything in LL at the second time. I will also buy it. 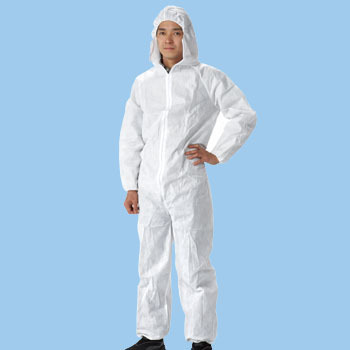 Because the working environment is bad, this protective clothing is satisfactory in price and easy to move. It's comfortable as it is a big size. This review is about item#09150827. My upper body is crouchful when crouching I want a chest or a chest pocket somewhere. The chuck is not 5 cm below the bottom side. I can not get over there when I went to the toilet with my protective clothing on. I think that it is good to stitch the position of sewing the chuck on the whole by 5 to 7 centimeters below. If there is no dissatisfaction of that point with the same price, even if it is 50 yen higher by another manufacturer, I will buy that. It is more durable and flexible than I expected. Before purchasing, I compared the nonwoven cloth of the home center and purchased it. I think that it is material cheap. We will use it for maintenance work of food factories etc. When I came in advance, I found an incomplete sewing of the packing mouth about 5 cm in the left upper arm. There are similar deficiencies of 3 sets of 10 sets of shoe covers purchased at the same time. It is an honest comment. I am sorry just because I personally liked Monotaro. I bought another one, but that is unconfirmed.